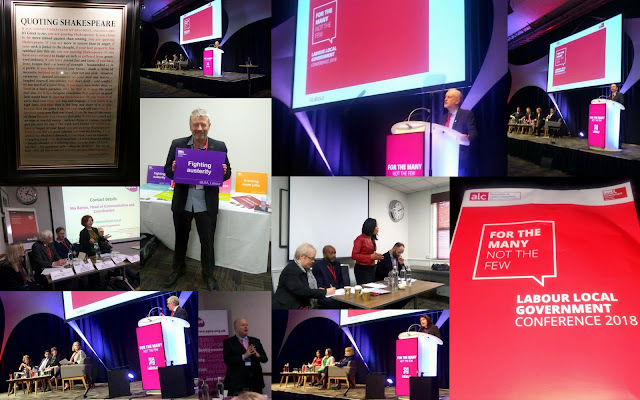 John's Labour blog: Labour Local Government Conference 2018 "Rokhsana Fiaz for Newham Mayor"
Labour Local Government Conference 2018 "Rokhsana Fiaz for Newham Mayor"
Last weekend I was at the Labour Local Government Conference in Nottingham. I really recommend this conference for all Labour Councillors. There was a conference dinner on the Friday evening and it was great to see how many people who were so supportive of Newham Councillor, Rokhsana Fiaz, for her to be a candidate for the likely Mayoral open selection process. At the conference itself on Saturday, LGA Labour Leader Nick Forbes,spoke about how unfair it was that Councillors only had only 2 NEC seats while unions have 13. He also made a point how Councillors cannot just "wait" for a Labour Government but have to deliver in the here and now. Jeremy also pointed out that the number people diagnosed at NHS hospital with malnutrition had tripled in recent years. "Services for the many have become cash cows for the few" and how "Private shareholders dine on public services". There was a number of really good debates and seminars during the conference. In the particular Apse on insourcing of council services back to public control. I asked a question to the meeting about whether Executive Mayors should be allowed to go on and on forever or have time limits? Didn't really get an answer strangely enough.